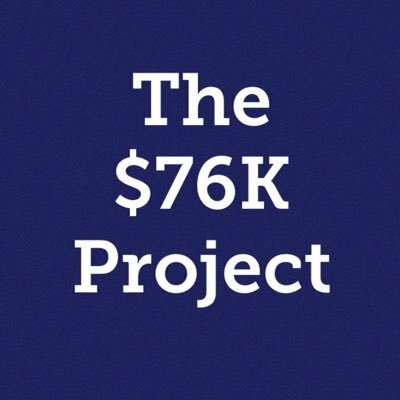 At the time, we were more than $76K in debt and coming to terms with what it would take to get it paid off. Fortysomething was working a sometimes lucrative, but sporadic, contract gig, while my 8-to-5 job paid so little that it barely covered the rent for our small, noisy apartment. We were implementing a budget but struggling to establish realistic expectations. We had a car loan, three credit card balances, and two student loans. Using the What's The Cost calculator, we estimated that it would take five years to demolish our debt. Budgeting - once we finally managed to crack that nut - helped us reduce our expenses; meanwhile, increasing our income accelerated our initial debt repayment plans. Within the past year, Fortysomething landed a salaried position. I took on a side hustle, and then, after a long and tedious search, I found a new job that paid more. With extra money to deploy, we were able to pay off the car and two credit cards. That said, we've also encountered some challenges. Last February, the unrelenting noise at our previous apartment became so unbearable that we used our tax refund to break our lease and move into a pricy duplex. It was a move that cost us thousands of dollars, money that could have gone straight to our debt. Instead, we used it to secure the luxury of sleeping at night. How much debt have we paid off over the last year? Car loan: Initial balance: $1,784. Current balance: $0. Amount paid off: $1,784. We paid off the car last October. It's our only vehicle, and we enjoy being a one-car family. Even more, we enjoy not having a car payment. Our plan is to drive this vehicle for another few years until it just won't move anymore. Once it dies, we'll either purchase a used car in cash or try to get by with walking, biking, public transit, and Uber. Credit card #1: Initial balance: $1,553. Current balance: $0. Amount paid off: $1,553. We paid off this credit card last July. It was our first debt win, and it came at a time when we could have easily lost interest in the process. Instead, it motivated us to keep going. Credit card #2: Initial balance: $9,667. Current balance: $0. Amount paid off: $9,667. Paying this one off back in February felt amazing. It was here that we really started to notice the snowball effect of paying off the car and credit card #1. We used part of our tax refund to wipe out the last few thousand dollars. Credit card #3: Initial balance: $11,067. Current balance: $3,821. Amount paid off: $7,246. This is the card that we're determined to pay off by the end of this month or the beginning of July. As I've mentioned previously, we had some help with this one. A family member gifted us some money (full disclosure there), and Fortysomething's been earning some summer side hustle cash. His side hustle salary plus his end-of-year bonus should be enough to take care of the current balance (perhaps with a little help from our savings, which I'm willing to dip into in order to get this done). Student loans: Initial balance: $53,219. Current balance: $49,305. Amount paid off: $3,914. For the sake of brevity, I've chosen to lump our student loans together. The one in my name has a balance of $10K, whereas Fortysomething's loan is about $39K. As you can see, our debt snowball hasn't touched this debt yet, but we're expecting the payoff pace to pick up come August. When you add it all up, as of today, we've paid off $24,164. I feel good about that. That's better than I could have ever imagined when we started. Recently, several members of the personal finance Twitter community encouraged us to start tracking our net worth in addition to our debt load. Because net worth takes into account both reduced debt load and savings/investments, changes in net worth often occur at a faster pace than debt reduction - thereby making it a rewarding number to track over time. We've been using Personal Capital to monitor our credit card and loan balances, and I've taken cursory glances at our net worth for the past several months. I'd been fixated only on the fact that that number is very, very negative, but then I dug deeper, focusing instead on how much our net worth has changed. As it turns out, since last November alone (November was when we started using Personal Capital), our net worth has increased by $25K. It's still negative, but it's not as negative, and the rate of increase has picked up. (1) Obsessive tracking. 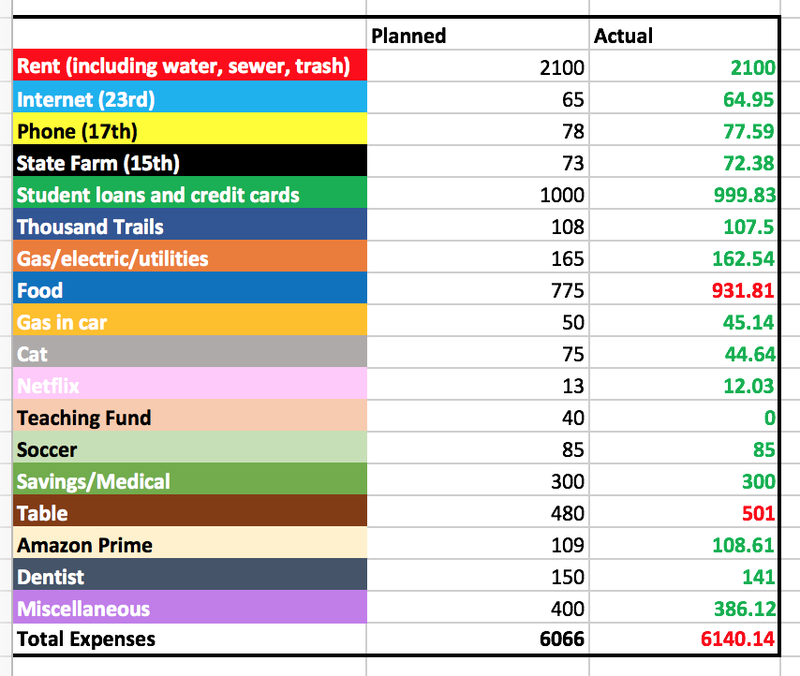 Since February of 2017, I've tracked all of our expenses in an Excel spreadsheet. I'm going to continue doing it. It's tedious, but it's become a habit, and it keeps me in touch with what we're spending on a daily basis so that we can make adjustments as needed. Several people have suggested that I simply use YNAB or Mint. For me, though, manually logging our receipts makes all the difference. (2) Spending less. We're certainly not the most frugal people you'll ever meet (you can tell by our grocery budget, which continues to be a hot mess), but we've dialed back our spending in a big way since starting this journey. We no longer book last-minute long-distance trips, make random furniture purchases, or replace our clothing all at once. We go out to eat less and participate in more free community events. When we do need to buy a more expensive item, we'll plan at least a couple of months in advance and fit the expense into the budget. (3) Earning more. Honestly, this is a big one. A higher salary is what's really allowed us to make such big strides over the past few months. Yes, spending less certainly helps, but on a limited budget, it gets you only so far. We were making so little to begin with that even with drastically reduced expenses, it would have taken us five very austere years to pay off all our debt. (4) Letting good enough be good enough. We are by no means doing this perfectly. We often come in over budget. Sometimes we go out to eat more frequently than we should. In my opinion, we spend way too much on groceries (I'm not the one who grocery shops, so I'm trying to let this one go). But we also realize that debt repayment is like an endurance sport: the most important thing you can do to ensure success is to just keep going, regardless of what that looks like, regardless of mistakes made in the moment. (5) Support from the personal finance community. As I had hoped when I wrote that first post, this blog has become a source of personal motivation and an opportunity to share our story with people who are in the same boat. It's also brought me into the fold of the personal finance community, one of the most encouraging groups of people I've ever encountered. The comments I've received here and on Twitter make me feel like we've got an entire team of debt reduction cheerleaders celebrating our every win, however large or small. I couldn't be more grateful. Thank you to everyone who reads this blog and/or follows us on Twitter and encourages us each step of the way. One year down, and this is only the beginning. Here's to another year of progress! A few days ago, I shared that Fortysomething and I will likely be able to pay off our third and last credit card by the end of the month. We're over halfway there: "only" $4300 to go. To be honest, I am nothing short of obsessed with getting this done, to the point where I am needlessly checking account balances twice a day. In the meantime, we've been going back and forth on what to do next: immediately go all-out on paying off my $10K in student loans? Stock up the emergency fund, then focus on student loans? Ramp up investments? After much discussion, we still haven't made a firm decision. My guess is that we'll probably try to knock out my student loan debt as quickly as possible, then increase savings as we pay down Fortysomething's student loan, which currently stands at a little less than $40K. We *may* also start shopping around for a home loan, just to see whether we could find a mortgage with a lower monthly payment than our rather exorbitant rent; if that's the case, we could be looking for a house by the end of the year. So the specifics of our long-term plan are up in the air, but what we have decided is this: in July, we're going to take one month off from all-out debt repayment. We'll still be making our overall minimum payment of $600, of course, and we'll still be adhering to a budget, but for just this short while, we're not going to be quite as aggressive in our quest to be debt-free. Instead, we're going to deploy our disposable income elsewhere. (1) We want to celebrate paying off the credit cards. When we started this journey last year, we had over $22K in high-interest credit card debt. Getting rid of that ball and chain is a big deal, and we need to take some time to high-five ourselves for the achievement. So what's the celebration plan? Well, I've asked for a few days off work, and we're going to head to the mountains for a little R&R at an inexpensive Airbnb. We'll try to be as frugal as possible - cook most of our own meals, find free activities - and of course we won't be racking up additional debt in the process. But yeah, it's time for a mini-vacation. I am so ready. (2) We have a list of things we've been waiting to purchase, and now is the time to do that. In particular, we're low on kitchen supplies, which is kind of inconvenient for people who cook most of their meals at home. Our wish list includes some plates, a pizza stone, a wok, and a saute pan. We also want to stock up on some home essentials - toiletries and the like - that are less expensive when bought in bulk. (3) We just need a mental break from the debt repayment grind. Don't get me wrong. I'm thrilled we're ditching our debt, and seeing our net worth increase month by month is exciting and rewarding. But for more than a year now, a huge chunk of our lives has been about debt. Frankly, it's tiring: tiring to always be tracking expenses to the penny, tiring to have to say no to so many things, tiring to constantly be reminded of our mistakes. We need some time away from this whole process so that we can re-energize and gear up for the next phase. (4) We want to be strategic as we move forward. From a purely financial perspective, the best next step would be to throw all of our disposable income at our student loans. But here's the thing: even if we put every extra last penny towards those loans, it'll still take between two and three years to pay it all off. That's a long time, and realistically, I don't think such a rigid, unforgiving plan is going to work for us. We'd like to build a larger emergency fund, and we'd like to increase our investments, especially because we're not in our 20's anymore and need to make up for lost time in a serious way. Taking a breather in July will give us a chance to figure out what to do next. So that's the plan! If you've been paying off debt or have paid off debt in the past, have you ever taken a break from the process? What were the pros and cons? Luck. Or, How We're Going To Pay Off Our Last Credit Card By The End Of June. I can't quite believe it yet, but it looks like we might be able to eliminate our $9000+ in remaining credit card debt by the end of this month. This is our third and last credit card. Our original plan was to pay it off by mid-autumn. This is turning out to be an unexpectedly auspicious month for us, though, and so we're putting those payoff plans into overdrive. (1) Fortysomething received a generous work bonus. The school he works for offers bonuses as a way to supplement low-ish salaries and incentivize teacher retention. We knew he would receive one at the end of spring term, but the amount varies each year, so we had no idea what that would look like. This year happens to be a good year. Every single penny of the bonus will go towards paying off the credit card. (2) Fortysomething is side hustling like a boss. He was initially planning to relax for most of the summer, but when a former employer offered him a short contract gig, he took it. We're kicking those paychecks to the credit card, too. (3) We received family help. A family member sent us a monetary gift when they found out about our medical bills. We decided to put it towards our highest-interest debt. This is absolutely a privilege and we fully recognize that. Part of me feels like we're cheating, but at the end of the day, the goal is to be debt free. If someone offers a helping hand, I'm going to take it with gratitude - and promise to pay it forward. I realize this post screams WE GOT REALLY LUCKY. The fact is, yes, we got really lucky, and it's humbling. We're lucky that Forty's school values its teachers, wants them to stick around for the long term, and recognizes the need to compensate them appropriately. We're lucky that Forty has strong, long-term connections with a contract employer who appreciates his skills and is willing to wait until the summer to send work his way. We're lucky that someone gave us a gift that will give us a leg up out of this debt hole. But I also want to give us a little credit (so to speak, ha) for doing right by these windfalls. Two years ago, this money would have been in our pockets for all of a hot second before we booked a vacation, bought new gear, and treated ourselves to some fancy food. Trust me, we would have spent it quickly, and little to none of it would have gone towards debt. Our choices now reflect a complete overhaul in mindset. They say that luck is a combination of preparation and opportunity. In our case, this month is flush with both. The lessons we've learned and the progress we've made over the past year have prepared us to make good decisions at a moment of prime opportunity. At the same time, yes, this right here is an example of privilege, and I'm not going to deny that. I worry that in posting this, I'm going to come across as smug or spoiled. But I want my blog to be an honest, complete account of our journey, so I'm putting it all out there. For the past few months, I've been tossing around the idea of taking some time away from alcohol. Apparently this is a popular phenomenon in Britain, where millions of people every year commit to Dry January as a way to recover and reset after an alcohol-soaked holiday season. The idea is to give the liver a break while stepping back to reflect on one's drinking habits. I first read about it a few months ago. The seed was planted, and over time, I had a growing sense that this was a challenge I wanted to take on. What can I say? I love wine and beer... but I'm ready for some time apart. I'll start by saying that although I could be totally deluding myself, I don't *think* I have a drinking problem. I mean, yes, I am obsessed with craft IPAs. That is true. But alcohol doesn't impair my job or relationships. I don't imbibe during the day, I never binge drink, and I've never made poor decisions like drinking and driving (just the thought of being impaired while behind the wheel terrifies me). All in all, I keep myself in check. However, I've fallen into the habit of doing what a lot of the people in my friend group do, which is to get to the end of the day and immediately grab a cold beer or pour a glass of wine as a way to take the edge off and relax. It's something I find myself looking forward to in the early afternoons when my email has piled up or I've had a frustrating conversation: Just five more hours and then that glass of Merlot is yours! The daily drink has become a habitual reward. I don't think a drink a day is necessarily bad or wrong. However, I'm the kind of person who (for better or for worse) doesn't like to feel controlled by anyone or anything. I was starting to have the strange sense that I was obligated to quaff that happy hour beverage. It became something I just did, no questions asked. That worried me. Who was in charge: me, or the booze? 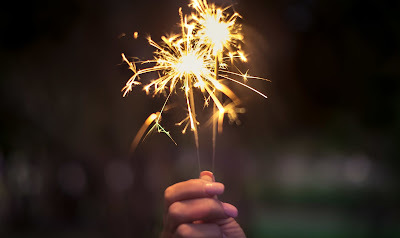 So that's my main reason for embarking on a Dry June: to break the daily drink habit, be more in control of my choices, and find other ways to decompress. Aside from that, I also want to build speed and endurance as a runner, and I've heard that ditching alcohol can support that goal. Alcohol causes dehydration; dehydration impairs running. I already live in a dry climate where I'm constantly struggling to consume enough fluids, so drinking beer and wine does me no favors in that respect. If I'm being completely honest, I'm also hoping that I'll naturally drop a couple of pounds now that those empty calories are out of the picture. I don't diet, ever, and I don't care about losing weight to meet societal standards of how a woman should look, but if I'm a little lighter, I'll be a little faster and a little less prone to injury. Plus, May was a boozy month. As I wrote in my May budget recap, several of our friends came through town, and our activities included brewery-hopping and imbibing. I feel the need to reset. My liver will appreciate a vacation. Lastly, I'm hoping to save some money. I estimate that we spend somewhere between $60-$100 on alcohol every month, depending on how often we go out to restaurants. Not drinking means we can accelerate our savings or debt repayment. Another win! I started Dry June a few days before the beginning of June. Even though we still had half a bottle of wine on the counter and a couple bottles of IPA in the fridge, I felt ready to go for it - so I did. I'm now on day eight and so far it's been much easier than I thought it would be. I was expecting to feel a bit lost without my nightly beverage, but so far that hasn't been the case (except for yesterday, when I satisfied my craving with some kombucha). I've been distracting myself with other things like making dinner, reading, and running. I know that this might get more difficult if I'm out with friends, but so far I've managed to avoid activities that involve drinking. The Dry January articles I read all touted the myriad benefits of ditching alcohol: less bloating! Weight loss! Clearer skin! So far I don't see evidence of any of that, but what I did notice almost immediately was improved sleep. Throughout the past few months, my sleep has been pretty crappy: at times I've had trouble drifting off, and at other times I've found myself waking up multiple times during the night. But over the past week, I've been waking up less, having more vivid dreams, and feeling more rested and alert during the day. I'd forgotten how great good sleep feels. I'm also digging this opportunity to pursue another personal goal and to push myself out of my comfort zone. It's not just about the alcohol. It's about growth and challenge. I've been craving that lately - challenge in my personal life. A chance to learn more about myself. If you've ever done a challenge like this, let me know how it went. And if you haven't, what do you think? Would you ever do a dry month? Oh May of 2018. I shall remember thee for your non-stop sunshine, the opportunity to see three - THREE! - different friends as they rolled through town on their late-spring adventures, and the beer. So. Much. Beer. I blame the visiting friends who insisted on hitting up every brewery in town. Okay, fine. That might have been me. *I* might have insisted on hitting up every brewery in town. I can't help it. I love beer, I especially love our local beer, and I love to show it off to people who haven't had the pleasure of trying it out. And when the weather's as nice as it's been the past few weeks, it's glorious to sip away on a sun-soaked patio while catching up on each other's lives. So when I tallied up our expenses this morning, I was fully expecting to find that we'd exceeded our budget for the Miscellaneous fund (the fund we use for spur-of-the-moment purchases throughout the month), and I was fully prepared to blame it on myself. My sense was that we'd (I'd) gone out to eat way more than we (I) normally do and spent way more than usual on food and drinks. I crunched the numbers and lo and behold, a miracle! : we were under in that area by nearly $15. I gave myself a big pat on the back. Yikes. I'm not quite sure what happened, but as you can see, we blew the grocery budget by $157. I suspect some of that is due to a glut non-food purchases, like toilet paper and mouthwash, that we sometimes buy at the grocery store (that's... a lot of toilet paper). Some of it might be related to the fact that we had friends over for a party, and we bought all of the food for said soiree. Some of it might reflect - you guessed it - more beer (don't worry, I'm doing a dry June, so this will give me an opportunity to see how much we can save when we avoid alcohol). 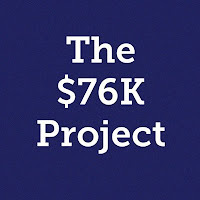 I'm a bit befuddled, as $775 certainly seems more than sufficient for a food budget for three people, but we'll pay closer attention to food expenses in June and try to eliminate any excess. We were also over budget by $20 on the table we bought from Wayfair. I'm not going to sweat it too much because a) we like the table and b) the order miraculously arrived with all necessary tools and parts, which is a total anomaly. I'll take it. 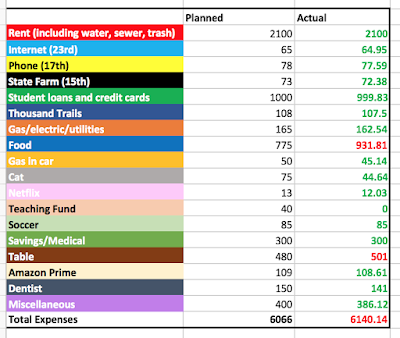 Other than that, it's worth noting that we had a couple of surprise expenses this month. One was our Amazon Prime subscription, one of the last remaining subscriptions we hold. We order from Amazon frequently, and the amount we save on shipping alone makes it worth the cost. The other was $141 for two fillings at the dentist. Fun. Thanks for never failing to be crappy, teeth. So where are we with debt? All told, we reduced our debt by another $706 last month, bringing our total debtload down to $58,831. Since June of 2017, we have paid off a total of $18,458! That's about a quarter of our total initial debt. As I mentioned in a previous post, we expect to ramp up the rate of debt repayment this summer. Evidence of this will come later this month when the first round of job bonuses hits our checking account. In short, I can't wait to see what these numbers look like at the beginning of July! So how did you do on your May budget? Any surprises? Any "oops" moments? And if you're paying down debt, how was your progress this past month?